Spring is finally here and the weather is warm.When the weather is warm I like to drink ice cold drinks. I like to drink those ice cold green tea drinks that the coffee houses sell. I recently went to a website of my favorite coffee house to look at their drink menu. I was shocked to see that my favorite tall cold green tea drinks had 35-45 grams of sugar in them. 35 grams of sugar is equal to about 9 teaspoons or 3 tablespoons of sugar. That is a lot of sugar. I had to find a way to make those green tea drinks at home and I found a great recipe that tastes just as good as the coffee house drinks but has way less sugar in them. I can even use the type of milk that I enjoy like almond or cashew milk. The main ingredient is those ice green tea drinks is Matcha Green Tea Powder. This green powder is what makes those ice green tea drinks so healthy and yummy. I have discovered that I can buy my own Organic Matcha Green Tea powder and make these wonderful drinks at home for way less money. I can also make mine with less sugar too, making my matcha tea drinks better for me. So what it Matcha Green Tea powder? Matcha is green tea leaves that are ground into a powder thus giving you a powerhouse antioxidant that has awesome health benefits. Matcha has way more antioxidants than blueberries and pomegranates. Here are some of the awesome benefits of Organic Matcha Green Tea powder. INCREASE MEMORY AND CONCENTRATION - The increased endurance from a bowl of Matcha Green Tea can last up to 6 hours and because of the effects of L-Theanine. It’s good, clean energy.Enhances mood - Matcha contains L-theanine, an amino acid known to relax the mind. For this reason, matcha is also known as a natural mood enhancer. ENERGY BOOSTER - There is caffeine in Matcha, but it releases into the bloodstream slowly. Matcha's caffeine has an alkalizing effect, resulting in a much gentler influence on the stomach, which gradually aids with digestion, healing, cleansing. LOWERS CHOLESTEROL - people who drink Matcha Green Tea on a regular basis have lower levels of LDL (bad) cholesterol while at the same time displaying higher levels of HDL (good) cholesterol. 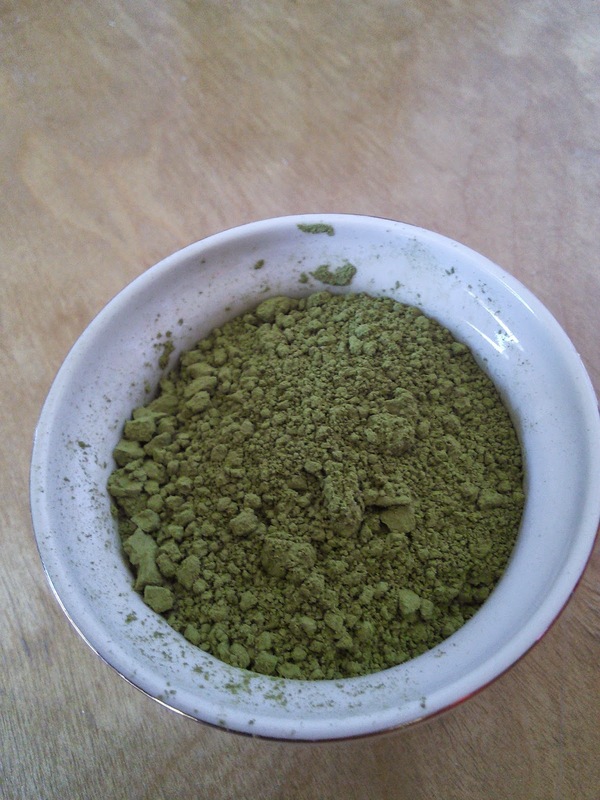 Matcha green tea powder contains 60% EGCg (epigallocatechin gallate). FAT BLOCKER - Matcha green tea increases metabolism and aids the body in burning fat faster.Matcha green tea contains the polyphenol EGCG, a thermogenic component believed to boost metabolism. 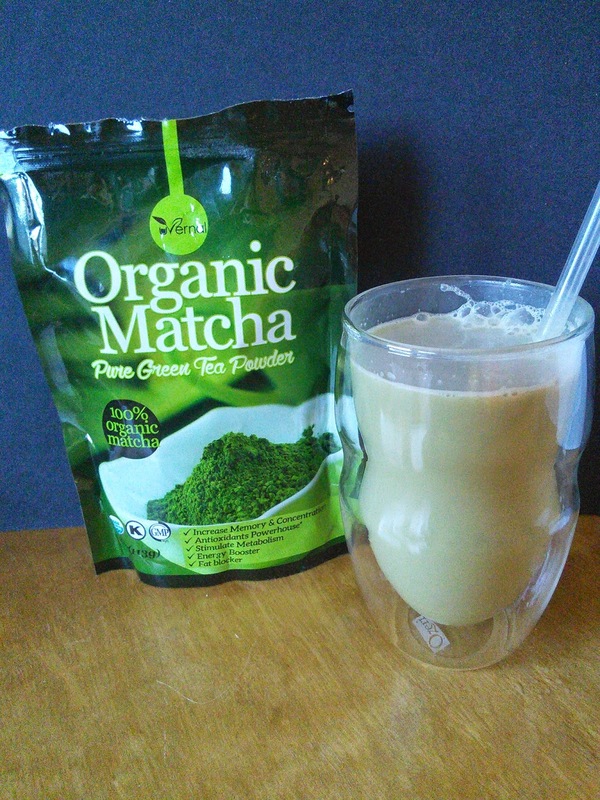 I was sent a package of Organic Matcha Green Tea powder from uVernal so I could make my favorite ice green tea latte drinks.Their Matcha is made from 100% organic green tea leaves and tasted wonderful in my drinks. I love that I can make 24 drinks at $1.00 each from their 4-ounce package. Place all ingredients in a blender and mix well. You can adjust the sugar to your taste. I find that one Stevia package is plenty for me but you may like it sweeter. Watch my video to see how to make this yummy ice green tea latte. Disclaimer: I received this item at a discounted price or for free in exchange for my honest review. All opinions are my own. Thanks for sharing the recipe. After living in Japan for four years, I still have not become a huge fan of green tea. But latte does look yummy! I've heard a lot about this product. Do you know if it's safe if you can't take something like Ginkgo, and things like that? I've made some hot drinks with this , have to give some cold ones a try too. I had never heard of green tea powder. I need to try this out!! I was just looking up DIY beauty recipe and a lot of them call for this dried green tea powder. I need to try it. I always wondered why that was so popular! Thanks for the information :) This sounds great, and so healthy! I am not a huge fan of green tea especially the powder. It doesn't look good to me. I have heard that it has amazing health benefits. Now that I am a bit older, I might try it again. I've heard a lot about this product. However haven't tries it yet. I have liked some Organic Matcha while not enjoying others. It all depends but I am always willing to try a new brand. I switched Happy Husband to green tea a few years ago. He loves it cold and sweet! Tara, another excellent find. I've not considered a green tea latte. I am curious how it would taste. First time I have heard of this product. Looks interesting. yum! I need to purchase this. I'm sure I would LOVE it! I've tried Matcha before and have never seemed to get used to it no matter what recipe I have used. But it really does help you a lot!! I am not a fan of iced teas, but i love a good hot cup of chai tea! I had some pocky sticks the other day dipped in matcha and they were tasty so I might have to try matcha to drink at some point. Thanks for sharing all of the health benefits! Tea can be so good for you! As cliché as it sounds, it's like my body thanks me every time I down a glass of green juice. I firmly believe the combo of exercise and these Green energy drinks have jump started a wonderful healing process for me.